Hey, it’s the one fight I predicted correctly! Barnett made surprisingly quick work out of Kharitonov, winning his second tournament fight by arm triangle choke. Barnett is my favorite in the finals at this point as he’s been pretty impressive thus far. I was stunned by this one. Daniel Cormier appears to have boulders on the ends of his arms as he was absolutely rocking Silva with every strike he threw. 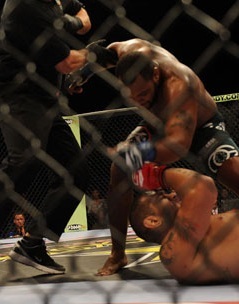 Cormier completely stunned Silva and most of the MMA world with this huge win. I…don’t even know what I saw last night. I’m particularly embarrassed given how little of a chance I gave Luke Rockhold, but he kept Jacare confused all night and took a clear decision to win the Strikeforce Middleweight Title. Okay, so I predicted this one correctly too, but it feels like a loss. I was pulling for Gracie, who got knocked out cold by King Mo at the end of the first round. Blanco opened up promisingly enough with some scary looking strikes and his normal wildness. Then he kicked Pat Healy in the face illegally…a lot. Then he got submitted. So really, not a good night for Max White.